The headline for Saturday’s newspapers could be â€œJohn Daly will be around for the weekend”. Unfortunately for John, after play was suspended due to rain on day two, the probable extent of his involvement will be to finish the remainder of his second round on the Saturday. Before the rain intervened, Daly picked up one shot (one bogey, two birdies) to move to five over through nine holes. With the cut projected to be one-over par, Daly will need close to a miracle to make it beyond the second round. Overnight joint leader Stephen Dartnall held his nerve and backed up his excellent first round with a solid four-under 68 in the best of the conditions early today to open up a two-stroke lead at 11. With half the field still to complete their second rounds, US PGA Tour regular and world No.70 Mathew Goggin was outright second on nine under after a second-round 70. 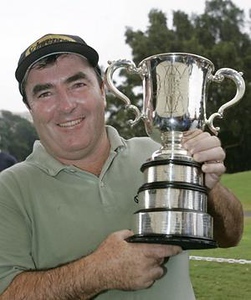 Australian Masters winner Rod Pampling was well in touch at six under (71), one stroke ahead of two-time former Open champion Peter Lonard, who quietly moved into contention with a tradesman-like 70 today to go with his first-round 69. 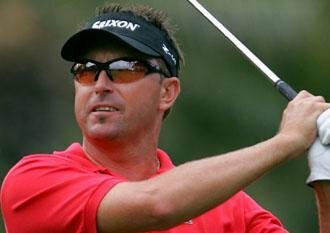 Robert Allenby was looking good early in his round before the heavy rain intervened. He had improved by four shots through nine holes to sit alongside Lonard on five under. 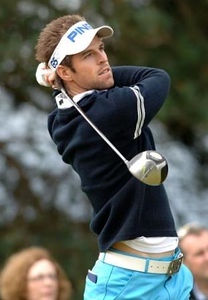 Australian PGA champion Geoff Ogilvy and 2006 Australian Open winner John Senden were both two under for the tournament with nine holes left in their second rounds. Nationwide Tour player, Ewan Porter has reason to smile again after undergoing a year from hell, which had started so promisingly with a win at the Moonah event. 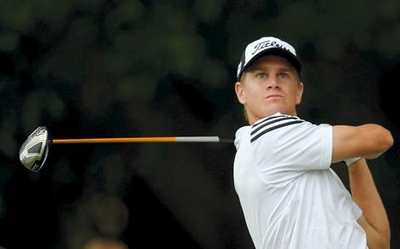 The 26-year-old from Sydney is outright third at six under after rounds of 65 and 71. “And the weather’s so ordinary that it keeps you focused on staying dry rather than what’s ahead and I think that helped me today.” “I can’t wait for this tournament to end, not in a bad way – so I can have a month’s spell, a month’s holiday,” he said. In contrast, defending champion Craig Parry and former champion, Stuart Appleby both shot 1 over par 73s to ensure they have something else to do on Saturday and Sunday. In the same boat are veteran Peter Senior (74) and Nathan Green (73). The second round will resume on Saturday at 6.45am and organizers are hoping to start the third round at 11.45am again using groups of three and a two-tee start. With high temperatures and fine conditions forecast for the Saturday, low scores are a real possibility for round three.